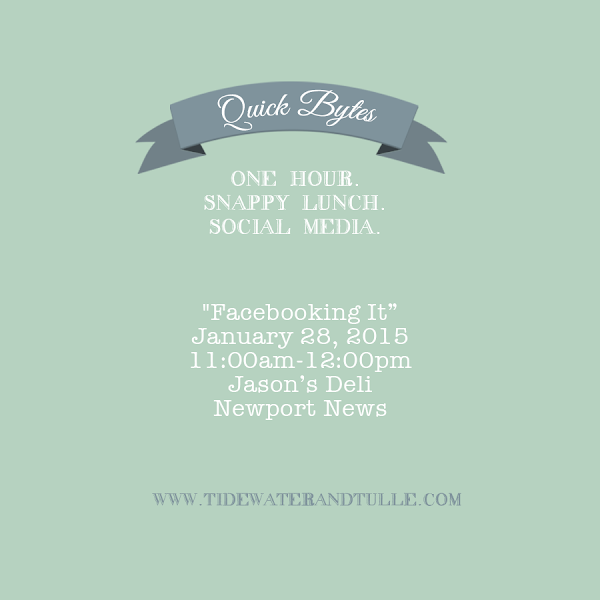 Last year, we hosted some great little successful working lunches for wedding pros called Quick Bytes… and now that it is slower wedding season again and requested by popular demand, we are bringing them back! To kick off 2015, we are starting with Facebook especially since they did a huge change this month to their algorithms. Oh, Facebook. The ever-changing and moodiest of all social media platforms. One day, it's happy. The next, it's sad. And the following day, it's about to go for the jugular. While there's no easy way to navigate this one, there are strategies and best practices with evidence for success. And we are going to go over that in two weeks! Not able to make it to Facebooking It? Leave a comment below to let us know what you'd like to learn about next! See our past get-togethers right here on Tidewater and Tulle.